China, Russia and other nations are exiting their dollar-denominated holdings in favor of gold. This action should put pressure on the dollar and U.S. treasuries, pushing not only central banks, but mainstream investors towards the safety of precious metals and other tangible assets that cannot be defaulted on. There will be a rush out of dollars and into assets with no counter-party risk, it is just a matter of how soon it happens. So says Jason Hamlin (goldstockbull.com) in edited excerpts from his original article* entitled China Hints at Dumping U.S. Debt, Saying De-Americanized World is Needed. China’s official news agency has published an op-ed commentary [see details at end of article] calling for the ‘de-Americanising’ of the world economy. They specifically mentioned the threat to nations with large amounts of dollar holdings, suggesting that one nation should not have the ability to impact the rest of the world economy so powerfully. In other words, one nation should not be able to print the world reserve currency or issue so much outstanding debt. China holds roughly $1.3 Trillion in U.S. treasury bonds, so if they decide to follow their words with action, we may see an accelerated selling of U.S. debt and dollars in the East. I don’t foresee an outright dumping of debt as many are anticipating, but I would not be surprised to see China’s treasury holdings cut in half within the next year or two. The Chinese move from U.S. dollars to gold has been very aggressive, yet under-reported by the mainstream media. At the current pace, Hong Kong will send, just to Mainland China, an amount of gold roughly equivalent to 50% of the rest of the world’s mined supply. Gold imports from Hong Kong to mainland China are set to double the imports from 2012. Not only are exports from Hong Kong to mainland China skyrocketing, but Hong Kong itself will likely import over 2,000 tonnes for the year. Considering that global mined supply (excluding China) is only 2,400 tonnes, this leaves the rest of the world scrapping for the remaining 400 tonnes. Editor’s Note: The following chart shows that through August, China has imported 994 tons of gold through Hong Kong, versus 511 tons in the year-ago period – and that doesn’t include the production of China’s domestic gold mines (300 or so tons, all of which stays within the country) and whatever else finds its way in through other ports. Assume monthly imports for the rest of the year average 100 tons, add in domestic gold production, and China will have accumulated at least 1,700 tons of gold in one year. One then has to ask where all of the gold is coming from that enters Hong Kong. It is coming from Western nations at a staggering pace. 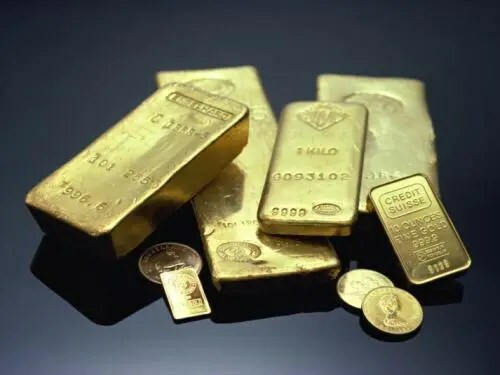 In fact, some have estimated that the United States is exporting more than they produce, quietly selling gold reserves in order to keep a cap on the price. Inventories are down sharply on the COMEX, as can be seen in the chart below. Noonan: Is Gold’s Decline Being Caused By Fed Payback Time to China? Whatever the exact truth may be, it is evident that China, Russia and other nations are exiting their dollar-denominated holdings in favor of gold. They have also been busy buying up energy resources around the globe and expanding their own reserves. This slow transition out of dollars and into real assets makes sense and allows them to get a good price for the debt they are selling. Shift From U.S. Dollar As World Reserve Currency Underway – What Will This Mean for America? Russia & China Have Power to Collapse U.S. Economy! Is Hoarding of Gold Their First Step In Doing So? This action should put pressure on the dollar and U.S. treasuries, pushing not only central banks, but mainstream investors towards the safety of precious metals and other tangible assets that cannot be defaulted on. There will be a rush out of dollars and into assets with no counter-party risk, it is just a matter of how soon it happens. The move out of U.S. dollars and debt is well underway, with a series of bilateral trade agreements being established in local currencies and the FED needing to step in and buy an increasing amount of government debt to stabilize the economy and avoid a default but the true panic has yet to set in, as many continue to have full faith in the ability of the U.S. government to service its debt. a failure of politicians to raise the debt ceiling in time to avoid a default. Whatever the spark that ignites the fuse, I believe it is wise to have some insurance against the possibility of a panic out of dollars. Gold and silver are the best insurance for this type of event and they happen to be on fire sale right now with some of the lowest dealer premiums seen in years. Such alarming days when the destinies of others are in the hands of a hypocritical nation have to be terminated, and a new world order should be put in place, according to which all nations, big or small, poor or rich, can have their key interests respected and protected on an equal footing. To that end, several corner stones should be laid to underpin a de-Americanized world. All nations need to hew to the basic principles of the international law, including respect for sovereignty, and keeping hands off domestic affairs of others. The authority of the United Nations in handling global hotspot issues has to be recognized. That means no one has the right to wage any form of military action against others without a UN mandate. The world’s financial system also has to embrace some substantial reforms. China continues to buy gold with both hands, keeping up all the gold they produce and importing even more! Imports were up 50% in October vs. the previous month; up 68% in November and up 74% in December. What will January bring given the continued weakness in the price of gold? Probably even more buying! 7. Russia & China Have Power to Collapse U.S. Economy! Is Hoarding of Gold Their First Step In Doing So? 9. Which Country Will Win the Race to Debase Its Currency the Most? 10. Is the First of Many Currency Crises Just Now Unfolding? Are Gold & Silver About to Take Off As a Result? 12. This Chart Proves That Your Currency Is Being Debauched At An Accelerating (Parabolic) Rate! Got Gold? 13. IMF Proposing New World Currency to Replace U.S. Dollar and Other National Currencies! 14. The Beginning of the END for the U.S. “Petrodollar”! 16. Will the Trickle Out of the U.S. Dollar Now Become a Torrent? 17. The U.S. Dollar: Too Big to Fail? 18. Is There a Viable Alternative to the Dollar as the Reserve Currency? 19. What Would USD Collapse Mean for the World? Is this return of dollars to America and a flight of gold to China a mistake or a silly accident ? It could be neither. There is always the possibility that a large scale market oriented payment system is in development, possibly one that distributes gold accounted for by its weight. In order to bridge the use of weighted payment for things priced in fiat currency, the bridge of “USD/oz” has to be used. The US (the FED) has the intellectual property rights on the use of that “debt-to-asset bridge” as we move toward the circulation of debt free bullion as a real-time (floating) currency.